When I taught college freshman writing, some of the topics I banned included steroids, teen pregnancy, abortion, euthanasia, and gun control. Why? First, after a couple of years of getting the same, tired topics from obviously recycled high school essays, I decided it was time for students to expand their intellectual and research horizons. Second, a lot of what these kids tried to write about are big, complex topics and, more importantly, fraught with emotional and religious influences. So when I read that KQED had created a gun control lesson for Common Core, well, I wasn't so much alarmed as dismayed. Just seems like a bad judgment call. 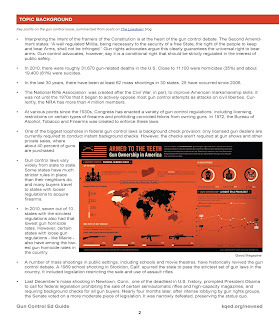 The opening sentences of the lesson read: "Gun control is among the most divisive issues in American politics today. For many, it boils down to a basic debate over priorities: the constitutional right to bear arms and protect oneself vs. an effort to reduce violence." Let's pretend these were the opening sentences of a freshman essay. After I sighed, maybe even groaned, I would do my best to refrain from making marginal notes until I finished the essay. Sometimes that wasn't possible and I'd have to start writing immediately. Please keep in mind I rarely used red ink, especially when I was going to be writing a lot. This is how the opening paragraph might look. The first sentence of this text suggests that gun control is only a political issue though history tells us it is far more complex. That leads to my concerns about the second sentence which suggests that gun control is simply a binary of priorities: own a gun or reduce violence. What I would not write on a student's paper is the absurdity of that statement. Well, maybe I wouldn't write that on a student's paper; I've been known to editorialize fairly strongly. Then there are two other statements in the text which present information as fact but for which there are no citations. I have some other issues with the generalizations in this opening paragraph and, if this were written by an 18- or 19-year-old college freshman, I might cut the student some slack if this were a first draft and not just because of the lack of objectivity. I think this is a difficult topic about which to write regardless and I think that using this as a potential lesson plan, Common Core or not, establishes a dangerous precedent. Maybe. 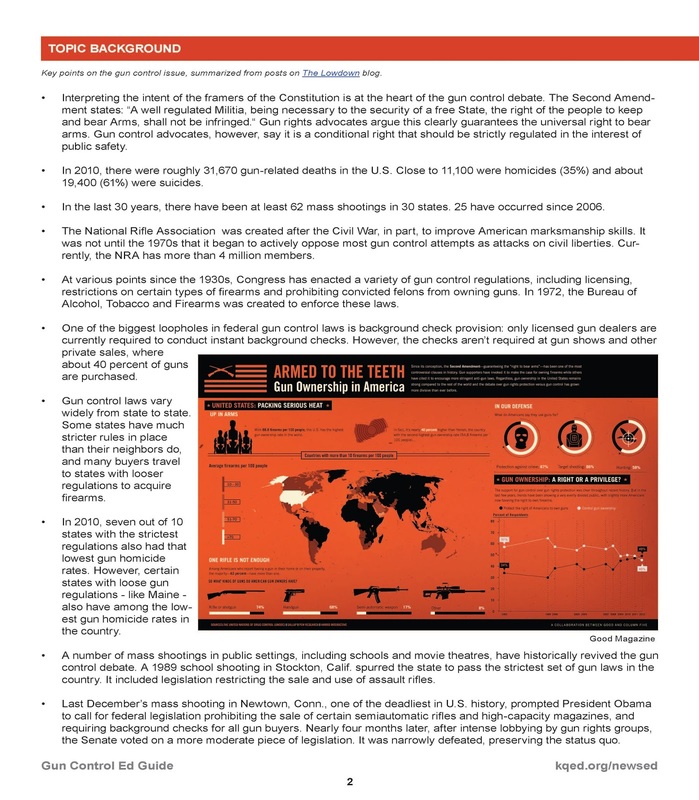 The second page of this lesson includes "key points on the gun control issues, summarized from posts on The Lowdown blog, which is part of the KQED site. I have to wonder how many teachers would go to the web site to check out the blog for themselves? And how many students do you think would go to the web site to check out those blog posts for themselves? To see how the posts had been summarized? What points had been highlighted and what had been excluded? None of the topics are cited either so it's impossible to know from which blog posts any of the topic points were summarized. In fact, all of the resources students are expected to use in this lesson plan come from The Lowdown site. Hmm. No, I misspoke, there are two other sources at the end of the 4th page. And, to be fair, one of the implementation strategies on page 5 points students to a PBS site. So I'm a fan of Common Core, in general. Provided it's well-implemented and people have a clear sense of why they're implementing whatever changes they're implemented. That's a different topic. However, Common Core encourages critical thinking and problem solving. One of the major facets of Common Core is providing evidence. So let me just say that this lesson is a classically poor example of evidence-based work. Based on the standards, this lesson looks as though it's designed for high school students. Okay, so what I would do with this lesson is present it without the names of the teachers and ask students to assess it as an evidence-based resource for examining the issue of gun control. What are the strengths of the lesson? What are its weaknesses? What would they recommend this teacher do to strengthen the lesson and to make it one that is relevant to them and their learning? In fact, I'd ask them to articulate what they think they might be learning as a result of completing the tasks for this lesson. What do they see could be the learning objectives for this lesson or for their recommended changes? There are, I might note, no learning objectives in this lesson as it is. They could rewrite the guiding questions and the focus questions. They could bring in different resources and think of different implementation strategies. But mostly I'd want them to think about what they could learn by completing this kind of a lesson. Is it civics? Is it political science? Is it social and community justice? Is it learning more about how the federal and state governments should be working? Is it about constitutional law and constitutional rights of citizens? Is it about how we frame arguments and debates? See it's not Common Core or the philosophy of Common Core that causes this. The only thing that makes this lesson Common Core is the inclusion of the standards in the guide. This is an example of a lesson that could be, and probably has been, delivered in schools. I agree that this lesson borders on teaching students to think in a particular way, and I find that very troubling. I believe we should be teaching students how to think and how to examine their attitudes, beliefs, and behaviors and to know why they have those attitudes, beliefs, and behaviors and then think about if and how they need to make any changes. This gun control lesson doesn't do any of those things and so, in my opinion, Common Core or not, this is not a good lesson.